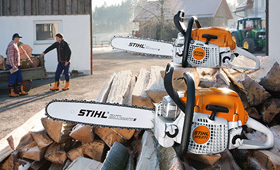 The STIHL chainsaws for agriculture, horticulture and public property are the robust allrounders among petrol chainsaws. Whether you’re building with wood, cutting firewood or maintaining stands – the machines in this performance class enable you to master a huge range of different tasks effectively. These models are available as basic versions or comfort models (C) with Chain Quick Tensioning (B), ErgoStart (E) for jerk free starting and QuickStop Super (Q) chain brake. MS 271 50,2 5,6 1) 2,6/3,5 .325"
MS 271 C-BE 50,2 6,2 1) 2,6/3,5 .325"
MS 291 55,5 5,6 1) 2,8/3,8 3/8"
MS 291 C-BE 55,5 6,2 1) 2,8/3,8 3/8"
MS 311 59 6,2 1) 3,1/4,2 3/8"
MS 390 64,1 5,9 1) 3,4/4,6 3/8"
MS 391 64,1 6,2 1) 3,3/4,5 3/8"